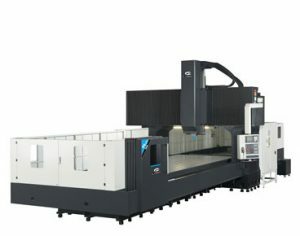 The Campro Turning Series is one of the broadest lines of horizontal turning solutions available in North America. With swings exceeding 25 inches and center distances to 60 inches, there’s sure to be an Campro lathe to suit your horizontal turning needs. From heavy roughing to high speed finishing, Campro products are designed with the strength and rigidity to thrive in your tough manufacturing environment. 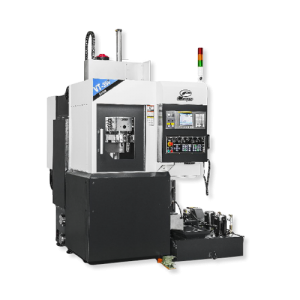 The CNC Turning Centers lineup is configured to offer a truly universal machine at a price that’s sure to bolster your bottom line. As special needs arise, let Campro build a Turning Center to your specification. Campro offers a wide mix of productivity enhancing options, including large spindle bores, part measurement, tool probing, steady rests, coolant systems, linear scales, control upgrades, live tooling and Y-axis. Box way models are available for your toughest applications, while the roller-type linear guide-way machines offer a potent mix of speed and rigidity. High torque spindle motors and servo systems assure smooth, vibration-free cuts in your toughest materials. All of the models come standard with a fast, trouble-free arm style tool changer. Options such as specialized coolant systems, spindle speed upgrades, rotary indexers and various probing systems allow you to personalize a machine for your specific application. 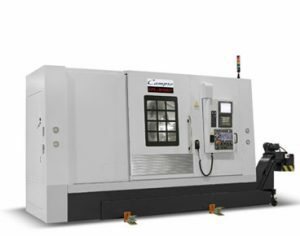 The Campro Horizontal Machining Centers are built to last, offering a powerful combination of speed and rigidity to users in any industry. Their design begins with a heavily-ribbed, Meehanite casting. Add large diameter ballscrews, a massive oil-cooled spindle and wide-stance ways and you have a rigid, high performance machine tool. 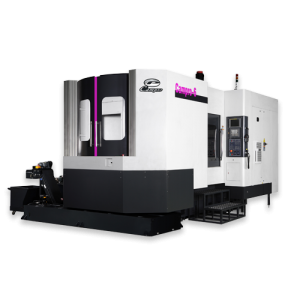 Options such as increased spindle speed, high capacity tool magazines, full 4th axis and various coolant systems allow you to tailor a machine to your specific application. Factory testing that features laser alignment and ball bar tuning assures a high degree of accuracy from the first part cut. 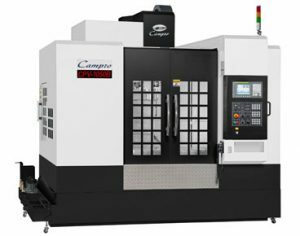 When you need a machine tool to process your mid to large size parts, look no further than Campro. Their Vertical Bridge Mill line offers the strength and speed to make short work of your toughest jobs. They start with massive Meehanite castings, annealed to eliminate deformation caused by internal stress. A quiet two-speed spindle, driven by a powerful Fanuc motor, offers a winning combination of high speed and torque. The fully sealed, immersion-type lubrication system with standard oil chiller circulates coolant and keeps the machine running cool at high RPM. The rigid feed drive system, featuring oil-cooled ball screws and powerful servo drives, assures smooth cutting and thermal stability. Campro VTL Series was designed with the high output user in mind. The turret style machines feature high torque drives for your toughest cuts, while their heavy duty ram system provides a greater level of support to enhance accuracy and finish. Massive castings and extra-wide way systems assure accurate and stable machining. Heavy duty transmissions, standard on larger models, allow stock removal at high spindle speeds. Campro feed system provides superior vibration absorption and chatter-free cutting, even under demanding conditions such as threading, grooving, interrupted cuts and heavy roughing. With work holding ranging from a 12-inch chuck to 90-inch, Neway has a VTL to process your workpiece. Machine Tool Solutions, Inc. solves your grinding problems with Supertec, the company that specializes in grinding machines. Surface, Cylindrical, I.D., Roll and Centerless. Solving grinding problems is an everyday task at Supertec. You benefit from 50 years of engineering and manufacturing experience. At Supertec, people make the difference and it shows in the quality and reliability of their machines.